Incoming students and their parents point to several distinctives when choosing Olivet for studying business with a Christian purpose. Students and graduates underscore the value of these, too. Students have many opportunities to earn the certifications that set them apart from other college graduates — Advanced Microsoft Specialist, Foreign Service Office, Microsoft Office Specialist, Microsoft Advanced Office Specialist, QuickBooks, Certified Public Accountant, Certified Managerial Accountant, Certified Financial Planner, Society for Human Resource Management and more. Olivet is one of only 10 Illinois schools offering this benefit. SAP is the worldwide market leader in enterprise applications software. Students with these certifications find many career doors open to them. Olivet accounting students who sat for the Certified Public Accountants (CPA) exam had the second highest pass rate among Illinois colleges and universities, according to Accounting.com. In addition, Olivet students had the highest average exam score among the top 11 Illinois institutions, including top-ranked Northwestern University. With a total of more than 125 years of business education experience, business professors make sure Olivet’s degree programs, courses and professional certifications are relevant and current. Offered each summer, this two-month study abroad opportunity adds an intense, real world experience. Students learn about international travel and cultures while studying companies and business practices in Europe, China and India. Olivet’s Enactus presentation team ranked in the top 32 of the 457 presentation teams in the nation, based on the team’s performance at regional and national competitions during the 2016-2017 academic year. Olivet’s Student Society of Human Resource Management (SSHRM) presentation team came out on top with first place among 30 teams in the 2017 Division I Case Competition. Career fairs, highlighting a variety of company and job openings, take place on campus. Workshops on interviewing, résumé building and networking help students prepare for the job search process. All juniors and seniors complete a field placement and/or internship as a degree requirement. 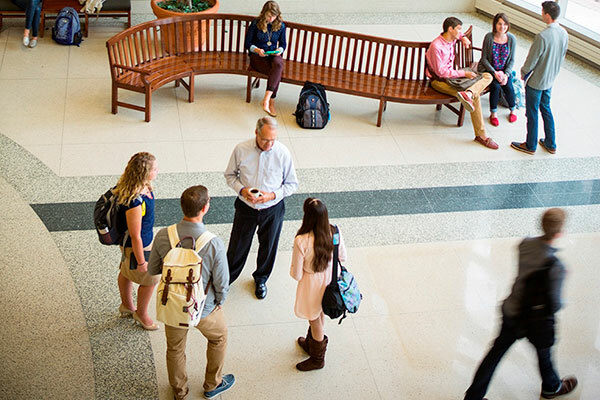 Olivet students and graduates have access to a global network of more than 40,000 alumni to help connect them with jobs. In 2016, the School of Business added four new study concentrations to the bachelor’s degree in business administration program: Public Administration, Human Resource Management, Operations Management and Healthcare Management. Student/consultants, applying the Lean Continuous Process Improvement training they are receiving at Olivet, saved $725,000 for Riverside Medical Center, Kankakee, Illinois, in 2016 alone.